Is Ryanair’s URL restructure to blame for its massive drop in search rankings? Ryanair has been undergoing something of a cultural revolution recently after initiating a novel plan to stop intentionally antagonising its own customers. It began with a simple Twitter Q&A with CEO Michael O’Leary and has developed into a full-blown marketing campaign aimed at softening the brand image and creating “a new Ryanair experience”. A major part of the new customer-friendly image is an overhaul of the company’s previously dreadful website. Gone are the annoying banners and fiddly buttons, replaced instead by an altogether cleaner look with a simple interface and navigation. Unfortunately something appears to have gone horribly wrong for Ryanair, causing it to plummet down Google’s SERPs for a broad range of important search terms. 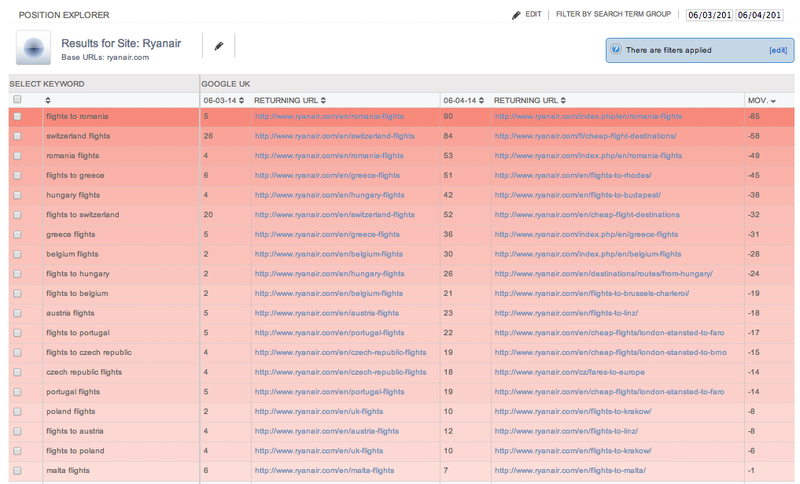 Data from Intelligent Positioning shows that the airline implemented a URL restructure during March and April, but has failed to correctly redirect the old pages. As a result Google is still picking up old 404 URLs, which is having a catastrophic impact on Ryanair’s search rankings. This chart shows how the situation has changed between March 6 and April 6 2014. The columns on the left show the original ranking and the URL for the various search terms, while the columns on the right show the new ranking and URLs as of April 6. Many of the URLs have been altered to include additional text such as ‘cheap flights’ or, more bizarrely, ‘index.php’. As a result of the restructure, many of Ryanair’s search results now return 404 pages. This means that it will likely face further penalties when Google realises that it is returning useless results. In fact this is likely to already be occurring, as according to Intelligent Positioning’s data the airline’s search result for ‘Romania flights’ had fallen to 53rd place due to the fact that it returned a 404 page, but when I searched for it on April 15 Ryanair didn’t appear at all. Similarly, when I searched for ‘flights to Poland’ Ryanair didn’t appear until page four, which is far lower than it appeared when the analysis took place around 10 days ago. Another problem is that the search result linked to a page that gave details for a random flight from Bristol to Wroclaw rather than any sort of hub page for travel to Poland. Data published by SimilarWeb in June 2013 showed that Ryanair’s site received more monthly traffic that British Airways and easyJet combined. British Airways and easyJet showed a more stable line throughout the year, with a more consistent flow of web visitors, however Ryanair’s lowest traffic point (December) was still bigger than easyJet’s busiest period in July. We obviously can’t tell which search terms are most valuable for Ryanair, but it’s clear that its current drop in search rankings will have a major impact on its site traffic. It’s safe to assume that Ryanair’s SEOs are aware of the issue, but as yet it seems that nothing has been done to remedy it, so we’ll have to wait and see how long it takes for the airline to improve its rankings. With so much change and ambiguity currently prevalent in the world of SEO it’s difficult to know what even constitutes best practice anymore. Lately I’ve been trying to navigate the murky world of black hat and white SEO and I although I think I grasped the basics, I thought now would be the perfect time to discuss current issues with an industry expert. Mags Sikora is an SEO Consultant based in London. Over the last seven years she has led a number of SEO projects for brands such as Expedia.co.uk, TripAdvisor, Avis, Mpora.com and currently New Look. The majority of those projects have consisted of large-scale audits, development, strategy creation and implementation, including all aspects of technical SEO and link building. She also helps smaller websites and startups to set up their own in-house SEO teams. Cycling has really picked up momentum in the UK. British success has made the sport more popular than ever and search volumes are rising. Inspired by the imminent Grand Depart of Le Tour de France from Leeds in early July, we’ve looked into the search marketing (SEO and PPC) performance of a range of brands in cycling to see how they’re set up to take advantage of this summer’s biking boom. A common practice when working in a digital agency is defining a marketing strategy based on specific goals, targets, budget and timeframe. This is one of the reasons why I wanted to make a chart which would easily demonstrate the process and metrics you can use for measuring performance and what channel works best for specific goals.